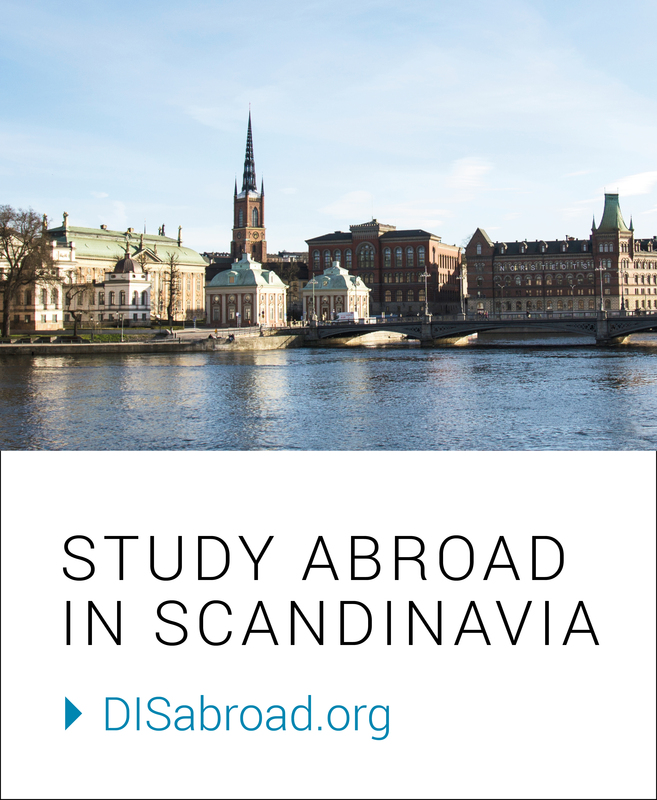 Wondering what a typical day in the life of a student at DIS Stockholm is like? Jennie from Temple University is studying at DIS Stockholm this spring and let us into her everyday rhythm and routine. I live in DIS apartment-style housing located on the island of Södermalm, which literally translates to “South rock.” Often called “Söder” for short, this area of Stockholm is known to be the cool, alternative, and hip part of the city. It has a ton of cool hangout spots, but my favorite thing about living here is the view out of my windows – and I’m lucky enough to have a corner room which means two great views! Granted, it can sometimes be gray and gloomy, especially in the dark winter months, but as the months go on the sun starts to come out and reveal just how beautiful the city is! Commuting is a huge part of the Swedish lifestyle. Since the city center is fairly small, a lot of locals choose to live just outside the hustle and bustle and commute to school and work every day. For me, it’s the same way. I have a quick 5-minute walk to the nearest Tunnelbana station, which is part of the public transportation system that runs throughout Stockholm. From there, I’m just seven stops away from DIS. While the T-bana is clean, safe, and efficient, the thing I love most about commuting is the unbelievable art scene found underground. Stockholm has the world’s longest art exhibit, with 110 kilometers and over 90 subways stations decorated with sculptures, mosaics, and paintings. The giant rainbow below is found at the stop right outside of school, which means I get to see it every day! DIS is located in a different part of the city, called Östermalm (can you guess? … “West rock”). It’s in the same building as Kungliga Musikhögskolan which is the Royal College of Music in Stockholm. Renovated just last year, the building is fantastic – it’s super modern (think Ikea) and its many windows let in as much light as the Scandinavian skies allow. What a great space to learn in! I’m taking some amazing classes, too: Scandinavian Crime Fiction, Swedish Politics and Society, Forensic Psychology, Swedish Language and Culture, and Psychology of Emerging Adulthood (linked at the end of this post). The topics themselves are fairly different from one another, yet they all seem to complement each other well. I scheduled my classes so that I have a long break for lunch. What’s really awesome is that there’s a restaurant in the same building as the school, called Café Oktav. The food is delicious, and DIS students get a discount, which makes it even better. Then I have another class, which rounds off the day in Östermalm! After school, I like to take advantage of living in the city. There are so many places to explore, but one of the most recognized – and one of my favorites – is that of Gamla Stan, or the Old Town. Sometimes I like going here just to stroll around and enjoy the winding cobblestone streets and cozy cafés. I can never say no to a “fika” in Gamla Stan. If you haven’t heard about fika yet, it’s the Swedish concept of taking a break from your busy day to sit down and have a coffee and a sweet treat. If I’m not exploring the city on my own, sometimes I’ll meet up with my Visiting Hosts. DIS offers the Visiting Host Program to students who are not living with a host family that still want to experience what it’s like to live like a local. I meet up with my host family about every 1-2 weeks to hang out and do something fun – we’ve cooked dinner together, played mini-golf, and watched movies. It’s a great way to engage with Swedish culture, and I’ve had so much fun getting to know them. After a busy day, I get to come home and hang out, relax, and socialize in the common room. Twenty-two students live on my floor, so there’s always someone around to talk to. The common room is filled with pillows, blankets, and string lights, which create a feeling of “mysigt” – the Swedish idea of coziness. We sometimes gather to watch movies or have potluck dinners where everyone brings a dish and we all share. Other times, I’ll just go there to work on a paper or do some studying. It’s a great way to interact with other DIS students who I don’t normally see in my classes. Regardless of what I’m doing, it’s nice to have a cozy place to come home to at the end of the day. That about sums up a day in my life here in Stockholm! My semester here has been one of the best experiences and I’m so grateful for every day that I get to spend in this amazing city. You may recognize Jennie from the @disstockholm Instagram! She has taken us on a few adventures so far this semester through the Stories – from DIScovery Trips to activities with her Living & Learning Community. You can find these posted on our Highlights. If you have questions for Jennie, you can write to her on Instagram at @jennieleeshaw. During her semester, Jennie lives in the Music Exploration Living & Learning Community. To meet the locals, she signed up for a Visiting Host, a DIS initiative that matches you with Stockholmers who are interested in cultural exchange. Read about the Visiting Host Program here. Previous VIDEO: Ice to Meet You, Greenland!